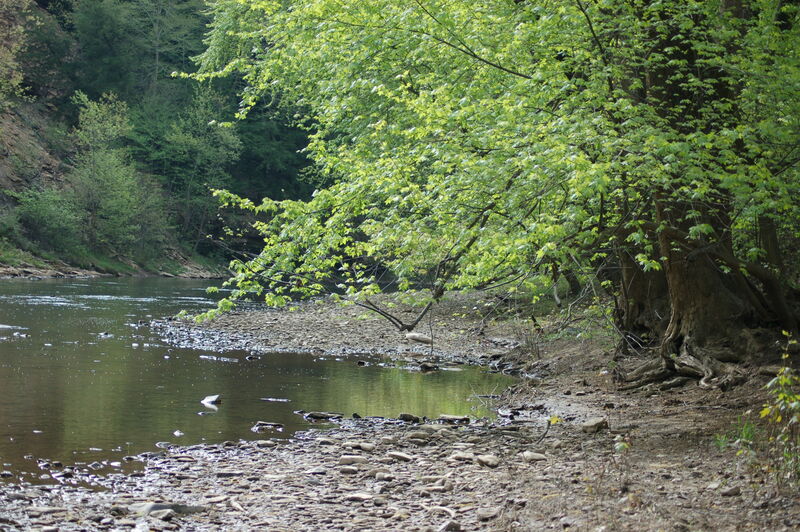 Friends of mine have been fishing “their site” north of Kittanning, Pennsylvania along the Allegheny River for years. An open invite was given to me and this morning I elected to hit the river for some fishing adventures. One of these friends arrived after 9:00. She caught a very nice bullhead catfish and lost a carp while I was there. 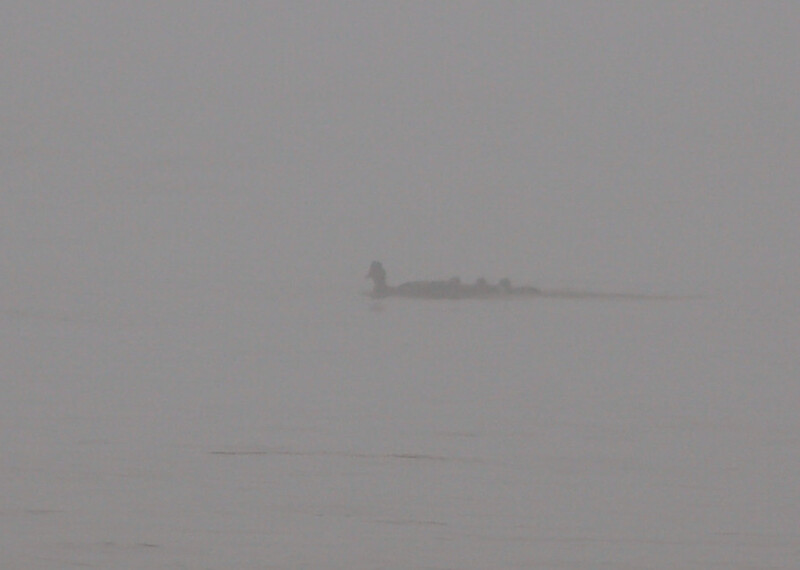 Early a heavy fog covered the waters and surrounding hills. 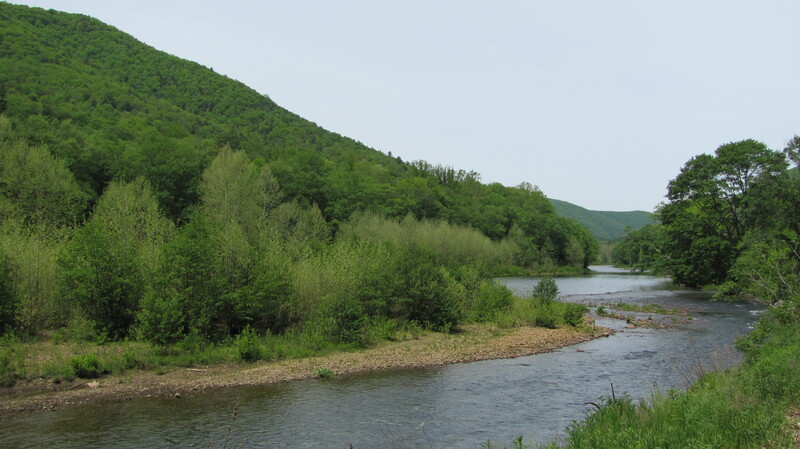 The waters were muddy and high and swift due to heavy rains in northern Pennsylvania. I hurdled in close to some structure and found a lull in the turbidity. I found much action in the following several hours. I missed several and lost several fish including a fighter. However, I caught a couple of nice fish too. One of the missed opportunities was when an eagle flew through the fog. I looked up for a better look and WHAM! I pulled back and missed! Other species of interest this morning were some mallards and a few young ducklings and a wood duck hen. She almost landed directly in front of me in the fog. I saw a water snake fighting the currents and a soft-shelled turtle on a couple of occasions. The first fish I caught fought hard and long. The channel cat was around eighteen inches maybe reaching twenty inches in length. A carp may have reached eighteen inches fell to my skills. This fish ran line far out into the waters before I finally landed it. I was using a rod and reel equipped for trout fishing including six pound test line. The fish felt heavy and fought very hard. I actually followed along the river’s shore around two hundred yards or so. I couldn’t turn this fish north. I saw brief images occasionally and several times a glimpse of the entire body. A carp! And a big one! The big guy may have reached the thirty inches of power category. I believe I would have landed this fish too if the critter had not become entangled in a fallen tree. I tried everything to dislodge the fish including giving the big feller plenty of slack line. Nothing worked so I ended up allowing my trophy to go. I had two other eagle sightings prior to packing up for home with an ever-increasing heat and humid day arriving in force. I had planned this hike at the Fred Woods Trail last week, but current and pending weather conditions forced a change in plans. However, this Memorial Day, I decided to head north into Cameron County to investigate this trail. 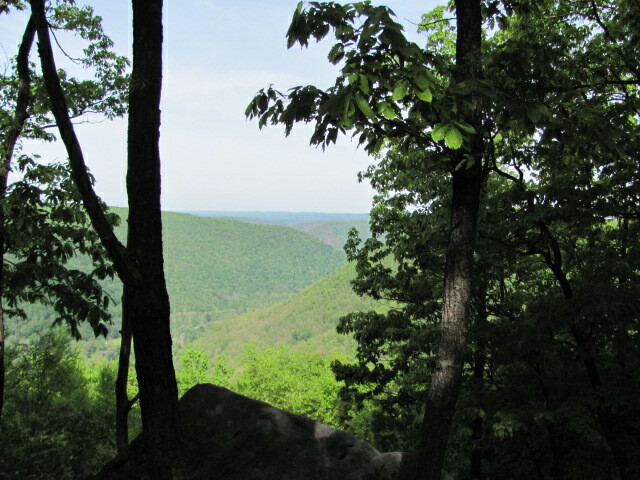 A friend, Marci told stories of massive rocks in the area where the Fred Woods Trail crossed the ridge’s top. I knew I need to spend some time at the area in the future. 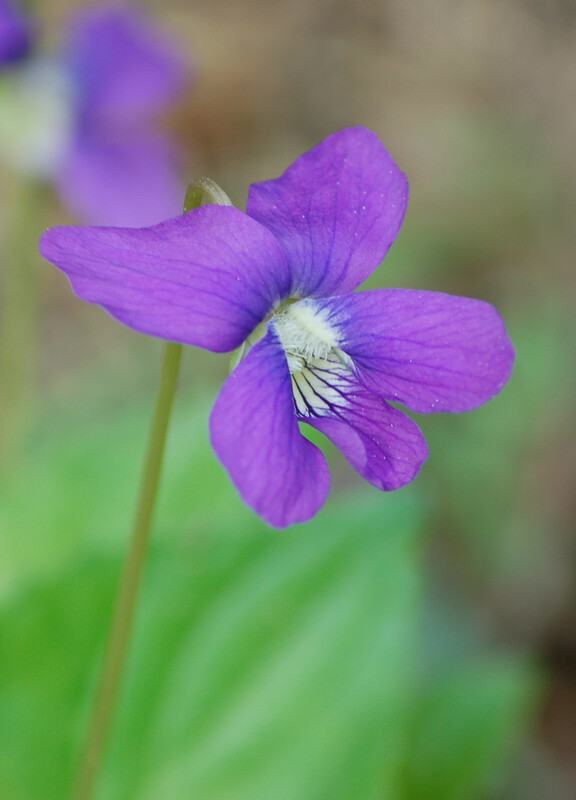 I had wished I could have done this hike on another day, since I would have loved to see either the Elderton or Kittanning, Pennsylvania Memorial Day parades. Again, watching future weather predictions forced a decision for this day. The temperatures are to rapidly increase into the mid-eighties by Wednesday and the nineties following on Thursday and Friday. The humidity is to, also, grow in moisture. I left the house shortly after 5:00 A.M. to arrive around 7:30 A.M. to the parking area for the trail. 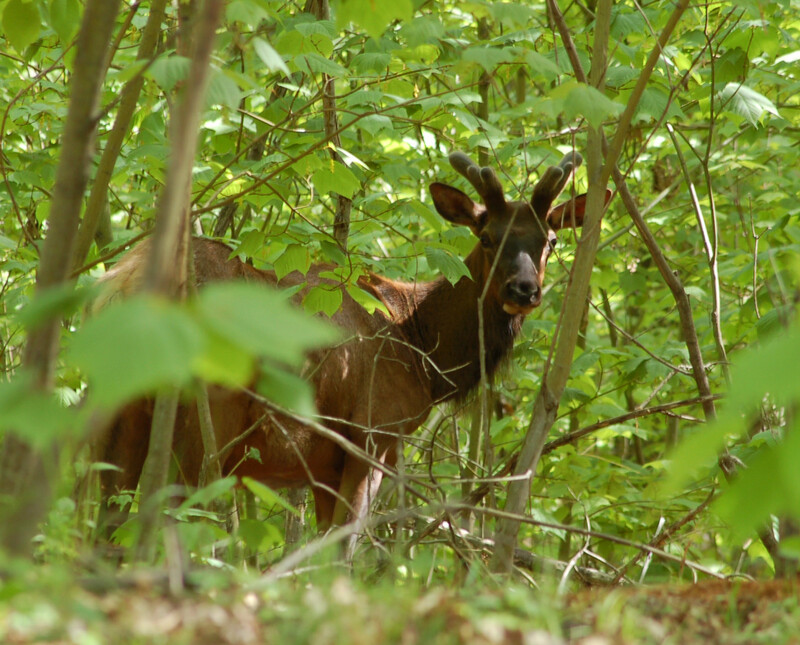 I gathered up my camera’s and my friend, Ruger and began the trek into the forest. A walking staff accompanied me. I was elated to have the third leg after moving into a section of trail loaded with rocks of all sizes. 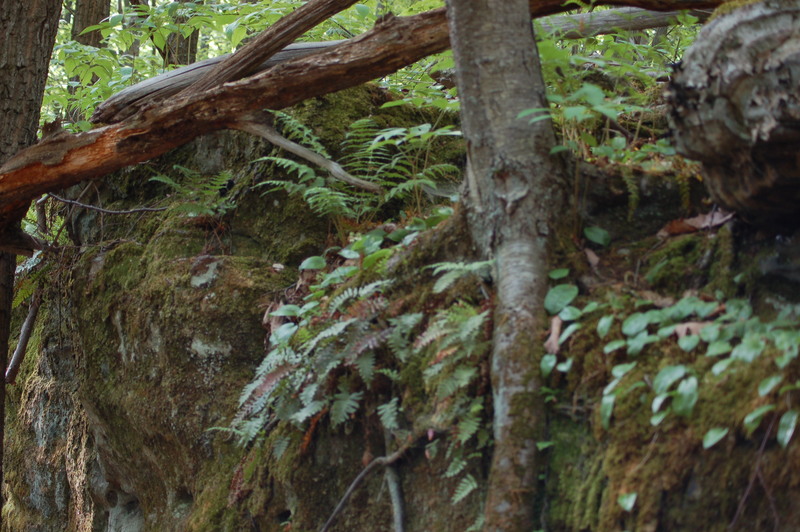 The forest’s habitat changed several times during this hike. The beginning featured hemlock and mostly maples. 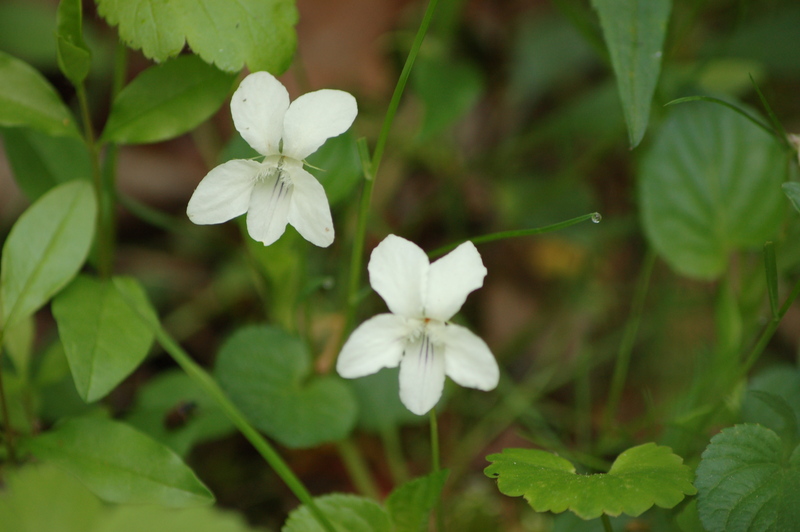 The forest floor, although beautiful, were covered with the hay-scented fern. 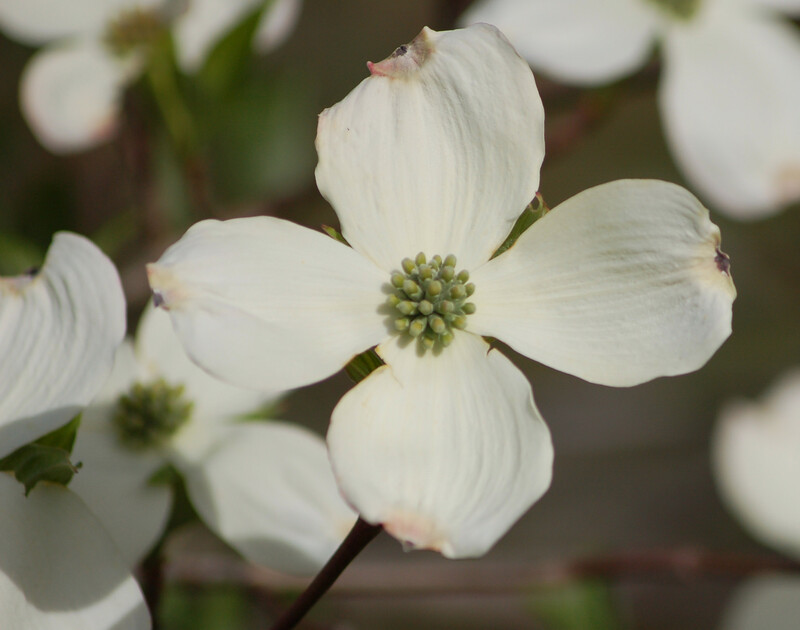 This specie emits a toxin that suppresses new tree growth. 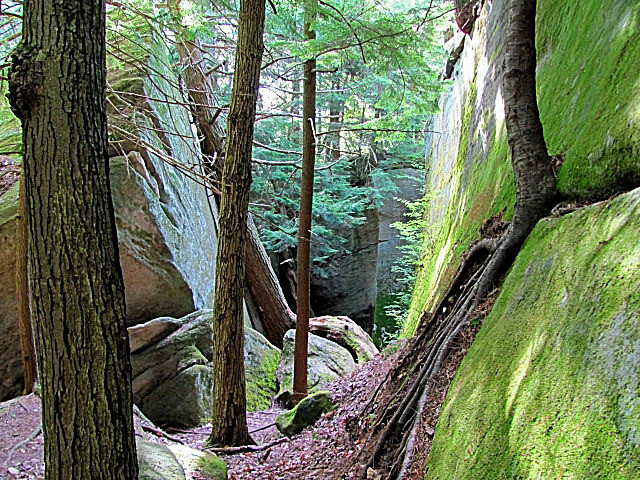 As I continued, the woods began to show signs of increasingly bigger rock formations. Here the woods were rather open. 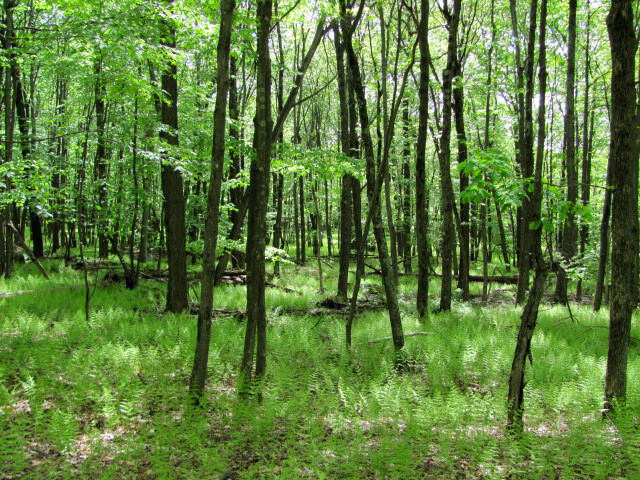 This area would soon show an undergrowth of dense huckleberry. A large area exhibited such growth. Farther down the ridge the Striped Maple overtook the understory. This maple is not a best specie for wildlife either. All through the hike cherry and oak saplings were scarce to non-existent although big oaks were often present. I had hoped to see a rattlesnake on this travel. However, the temperatures were somewhat cool. Frost could be viewed along the lower areas as I traveled to the trail. I talked with a local and he said he catches them at times and knows of a den near his place. Boulder fern and Canada Mayflower on rock’s edge. The rock formations were, indeed, big! Many of the rocks were much bigger than a common home of poor people like me. Many had split many years ago. 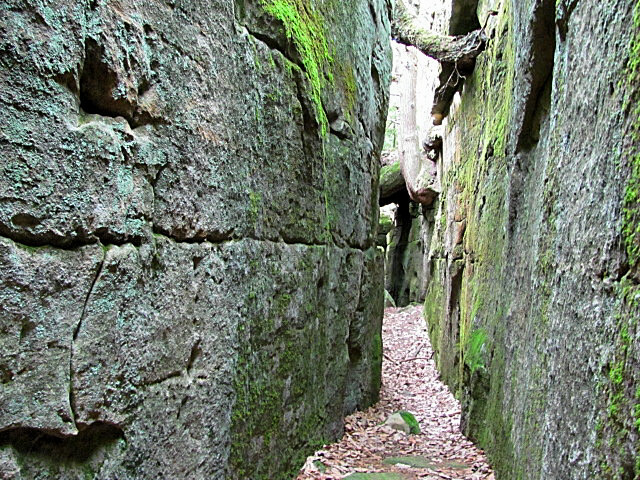 Trails between these splits easily exposed how the rocks had fit together in times past. One such corridor went for around a hundred feet or more. The rocks were big like I said! Bull elk with new antler growth and summer hair in place. Two sites are kept open for hikers to view beautiful vistas. 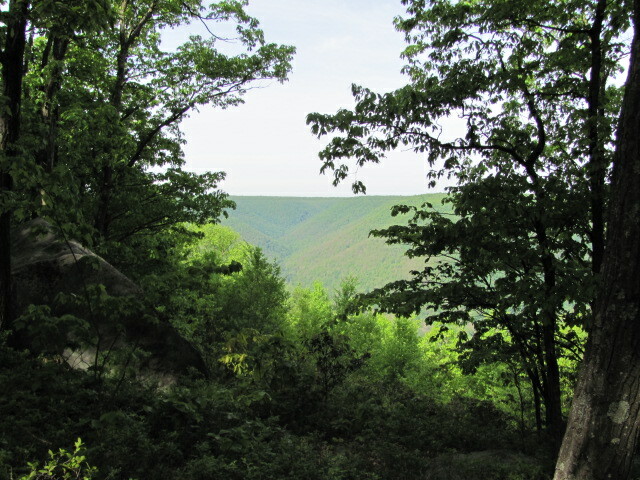 The mountains are grandeur in God’s Country Pennsylvania. One vista is called the “Water Plug Run” with the other called “Huckleberry Vista”. I set for a time to take in the splendor! Critters of interest were one gray squirrel and lots of chipmunks. I saw three deer here and four deer while traveling. I saw two turkeys and an elk while traveling too. However, I was thrilled to walk up ion two bull elk while traveling the trail! I knew seeing them was a possibility, but yet, I was taken by surprise when I encountered the two. On a sad note a small group of ravens were viewed feasting on a dead bull elk. Warblers were singing all day. I saw an American Redstart and vireos along with a Blackburnian Warbler. Oh, how I tried to capture this specie with the camera! I almost did! Leaving the trail was a sad event. I would have liked to stated much longer. 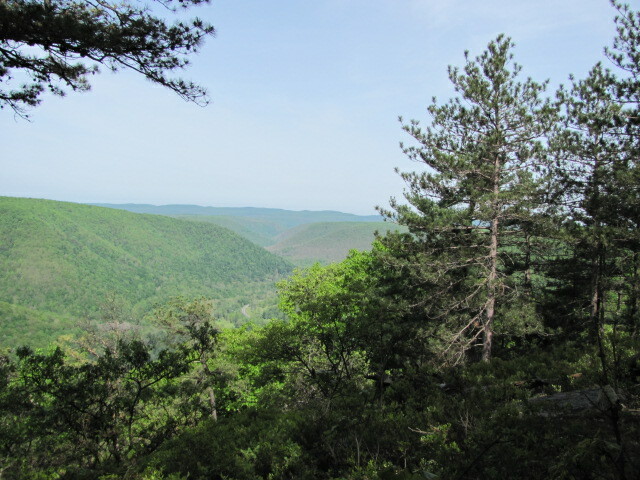 I stopped at the Bucktail Overlook for a spectacular view of the mountains of the area. this was almost a 360 degree view! My step father, Bob and I waded across the thigh-high field to obtain a listening point. Bob had heard a gobbler near yesterday. At 5:30 A.M. I told Bob to wait while I continued towards the field’s edge to listen. The windy conditions made hearing difficult, but I heard a gobbler. His gobble was subtle, but I knew I heard one. Shortly, I heard it again and a direction was certain. I called Bob on his cell phone telling him to come down over and across towards me and the woods line. 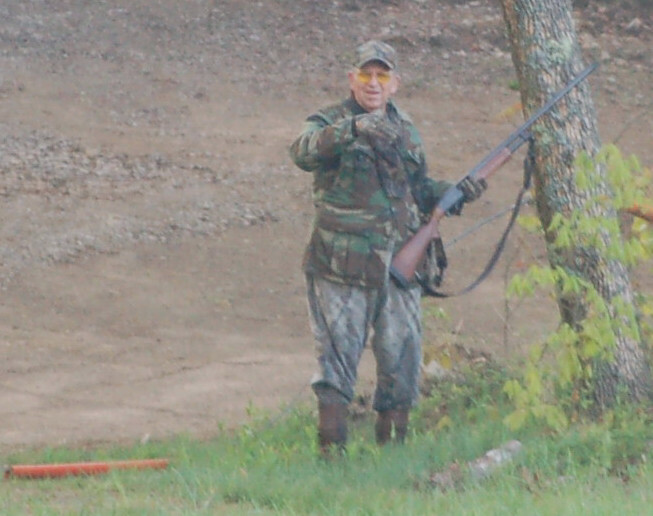 Bob, after reaching me, heard the gobbler too, as we closed in the distance. I hesitated at the woodlands edge for I heard hen talk. Once I determined the hen talk was real, and not someone calling, I set Bob up and moved to try to scare them away. I wanted to move them away from the gobbler that appeared to be approximately 100-125 yards farther along this ridge. I managed to get to 40 yards of the two hens. I watched one preening before I made a dash towards them. The two hens flew over the ridge’s edge and the gobbler went nuts for a minute. A second tom gobbled once alongside the more vocal turkey. I returned to Bob and began calling. The woods erupted for a brief time. While setting there listening to the gobbles a deer walked through the field and a full-striped skunk walked within yards of me. The gobbler remained on the roost longer than I had hoped allowing much time for the hens to return and, at least, one did. The woods became quiet. Later, I eased down over this ridge to a field. Here I saw a hen in the field. The big gobbler apparently went towards another field with his buddy and a hen (s). Bob was ready to head home and we arrived back to give my mother a rough time by 7:10. Bob said he may go back later today. Later, I visited the Armstrong County Historical Society museum to meet with some youth from the Grace Brethren Church of West Kittanning. The subject was French and Indian War through Revolutionary War military. the young-uns asked lots of questions and I enjoyed their company. 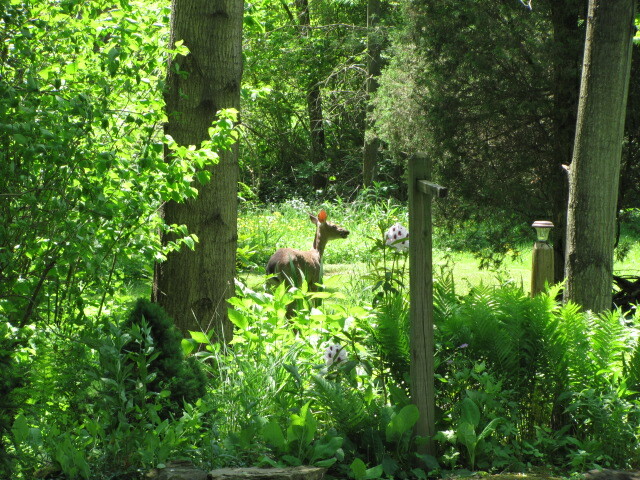 Last Tuesday I awoke and decided to go listen for turkey activity before gathering up some landscaping rocks and ferns. The morning was warm and humid as I listened to a gobbler gobble from across the hollow. I saw a woodcock and one deer. A doe on my property. I chased her away from the road. 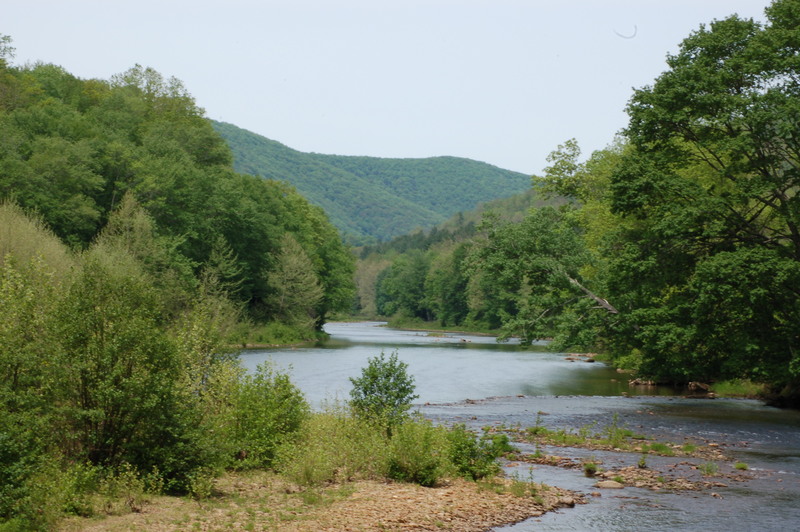 The dam over Crooked Creek in Armstrong County, Pennsylvania was erected during the 1930 time frame. 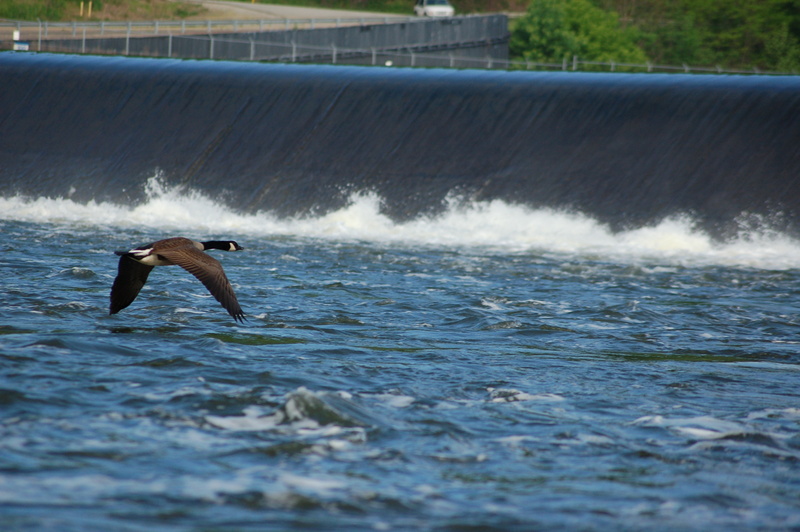 This dam and others on tributaries of the Allegheny River were erected as a flood control measure. 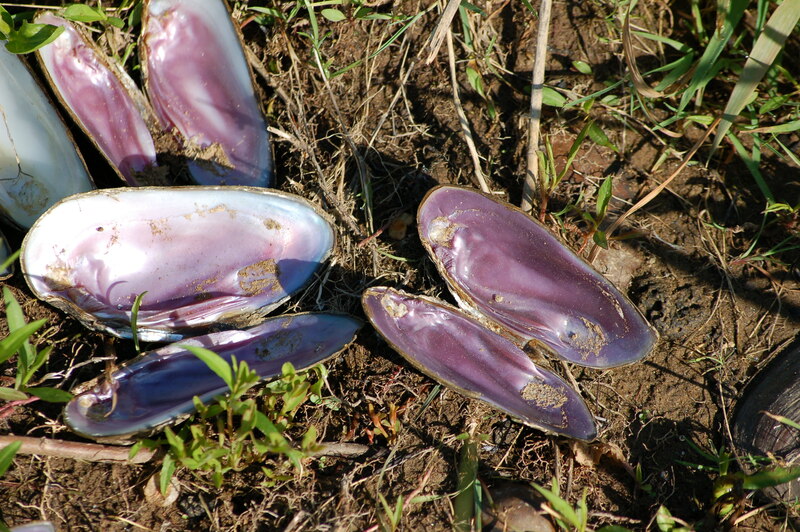 They hold water back during times of extreme rains or snow melt. I was told, a 50 caliber machine gun was installed on the dam during World War Two. This measure was done to thwart any attempts of enemy aircraft getting through to bomb the dam. Of course, we know the enemies of that era never made any attempts on the dam, but had the war gone differently one never knows. Friday morning, I elected to fish the waters of Crooked Creek where the overflow area is. This is where the water of the dam is controlled and let out as needed. The site has always allowed me to catch fish. I have caught many species over the years here. This morning I caught a number of bluegill and pumpkinseed sunfish. Had I other types of bait more species may have had been landed. While fishing I watched a deer downstream playing in the water. 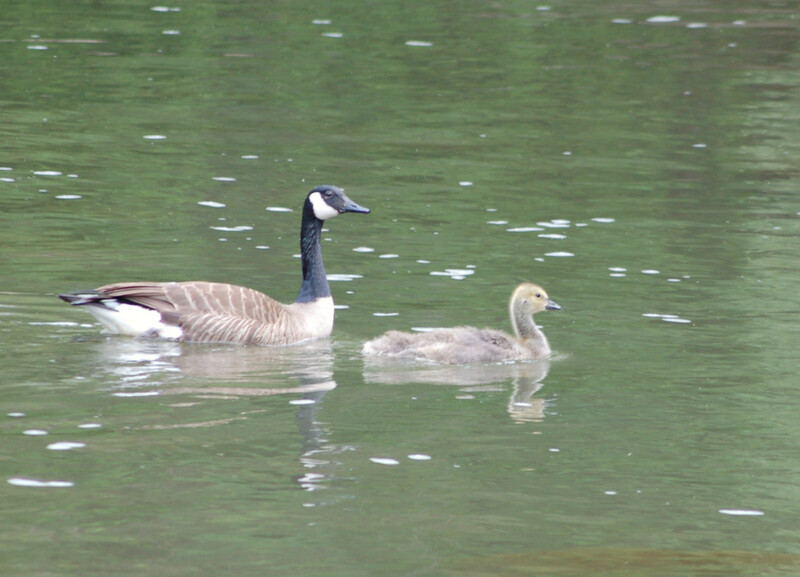 I, also, watched a Canada Goose and gosling swim about. I, as usually the case, fished a couple of hours and began hiking some of the park’s trails. During my walk, I saw five wood ducks; more geese and two deer. I watched around for signs of fawns, but I failed to see any. I saw a lot of squirrels and chipmunks too. I, occasionally, looked over the creek openings for eagle and osprey flights. Later in the evening, Laurie and I went to Evangel Heights Church to watch the high school musical, “Esther”. This is a Bible story of a young Jewish maiden who, eventually married the King of Persia. She later used her influence to save the lives of her people the Jews. 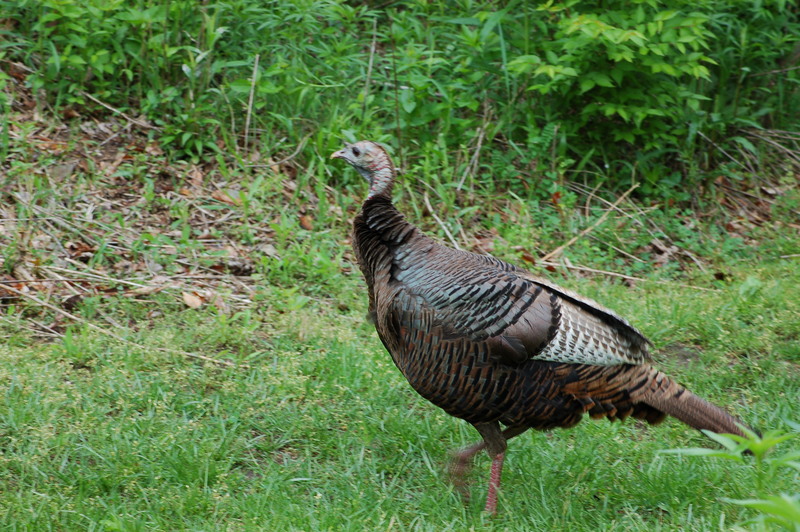 Of course, I saw a gobbler strutting around 6:00 P.M. while in route to the play. 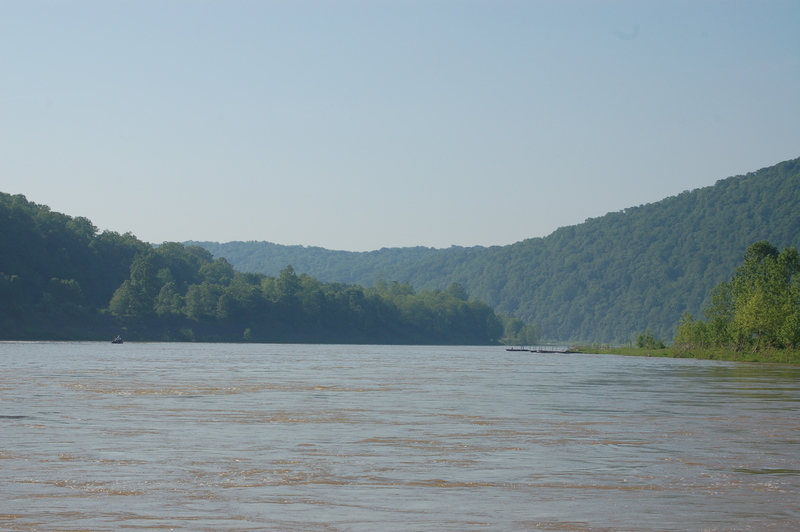 This morning, since I still had some worms, I headed for the Allegheny River at Kittanning. Pennsylvania to see if the fish were biting. I decided I should just feed the fish since I failed to catch any. Subtle bites occurred, but they were never hard enough for me to strike. I suspect the Eastern Sand Darter or small yellow perch may have been the lucky fish. My size six hook were too large to effectively catch them. 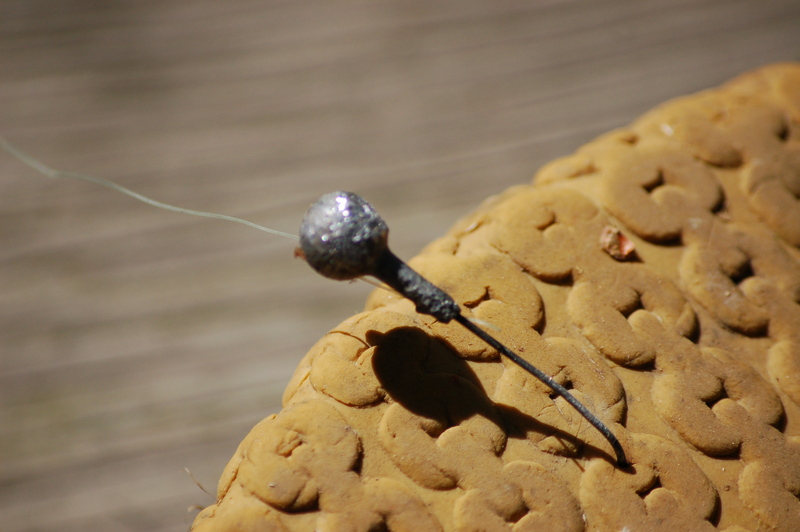 A hook in the bottom of my shoe….. 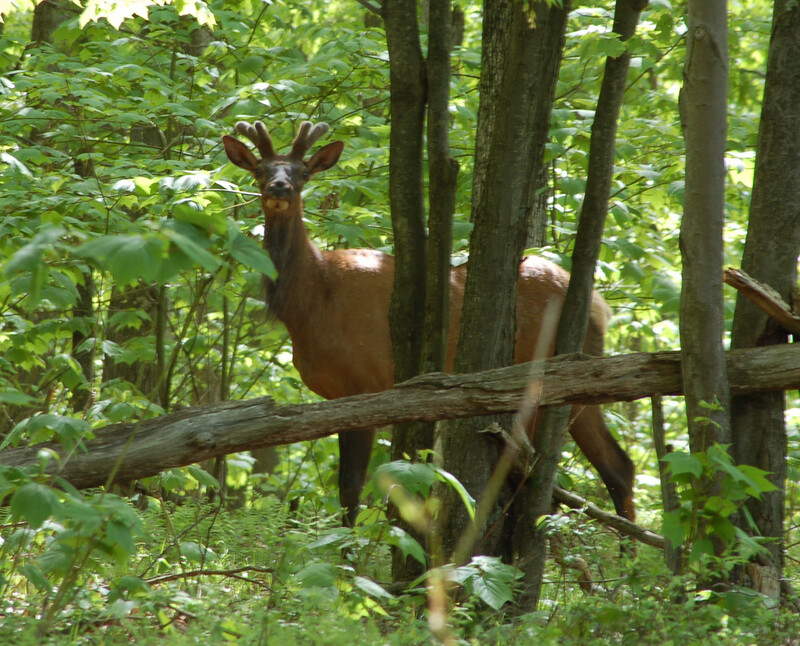 However, wildlife was abundant to watch. 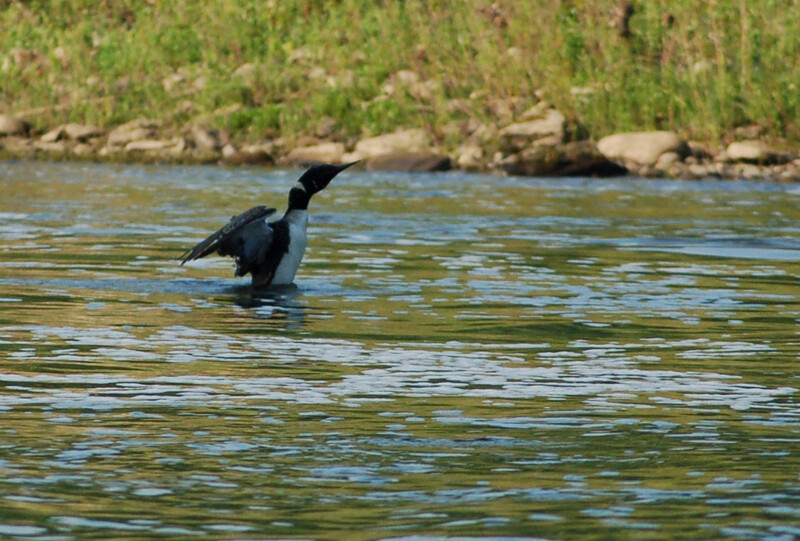 The river yielded the usual Canada geese and mergansers. I, also saw a few mallards swimming about. A most interesting specie was observed. I was blessed to see a loon all morning. 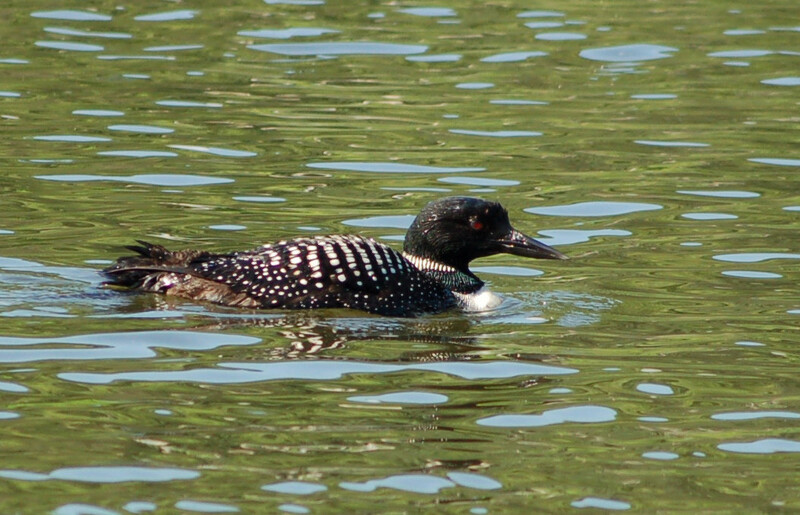 The bird would swim about with its head underwater seeking food and, at times the loon would dive completely under only to reappear twenty or thirty feet away. Directly behind my fishing spot are large rocks. Swallows had their nests in these rocks. The swallows, up to twenty of them, would continually flutter around. Occasionally, one would enter the rocks to visit their nests. My step father, Bob and I circled around the field early so we could be in a better position if he sounded off this morning. The gobbler had been along this ridge twice. This fact gave us a good starting point to listen and, hopefully, allow for a quick and close-set up. 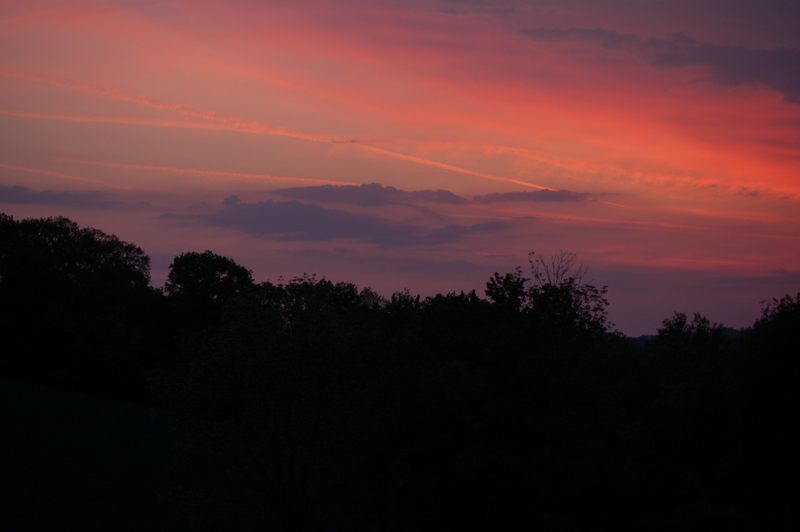 We stood along the field watching two bats constantly flutter back and forth over our heads. Many warblers were singing, a woodcock was “sniping” as the sky appeared to be opening up from the cloudy conditions earlier. We proceeded along another field and moved higher in the field to listen. I heard him farther out the ridge. We made some moves trying to better locate the bird and get closer. the gobbles seemed to get softer. I estimated the gobbler to be in the woods at the field’s edge now. We gambled and traveled along the opposite edge of the fields allowing the terrain to aid us in our approach. The foliage would, also, help concealment. We quietly crept into the woods. This woodlands is about 30 yards of level terrain before drastically sloping another fifty yards before leveling off again onto another field. I called once and moved inward and called again to hear a sharp response from a hen followed by a gobble. We were close! All we could do was set up and hope I could anger the hen enough to come towards my calling bringing along the tom. She did the norm by taking the gobbler away from us. Bob was ready to go home and harass mom and have breakfast. We quit at 7:45 A.M. I saw a grouse, a deer and a family of five young woodcock. The mother did her hurt wing routine. I went towards the flushing point to see the young birds fly away. They were not all that little. 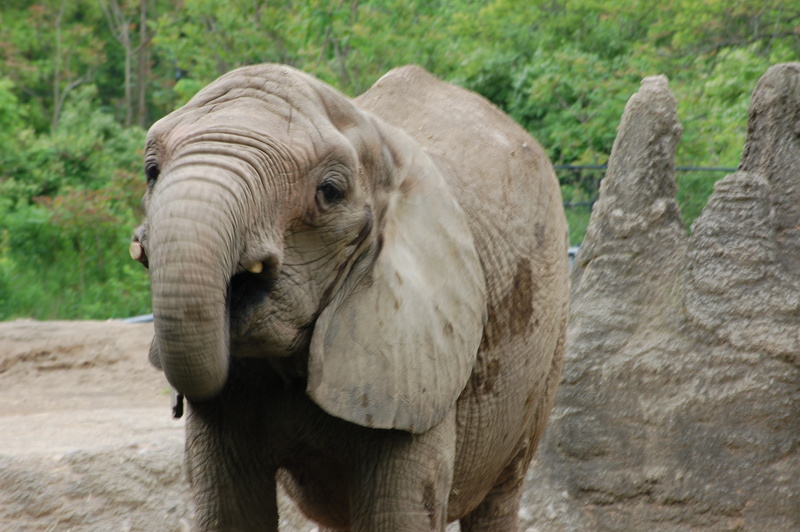 Yesterday, Laurie and I went to the Pittsburgh Zoo early. I enjoyed the wild turkeys walking outside of the zoo’s main entrance. I, also enjoy the aquarium building. I enjoyed the turkeys and chipmunks more than the more exotic species. But, that’s me! Bob and I had a plan. He would walk a field to listen and I would circle another field to listen for gobbler music. The planned worked well. I heard my first gobbler far away followed by a second on the same hill as I, but down over quite a distance. I heard a third tom and this bird was closer. I called and he answered. I had his roosting site in my sights! I called Bob and told him to meet me at the car. We hurried and set up at the best site we could find. Notice I said the best site we could find for the calling site was far from perfect, but it would have to do. The bird seemed interested as I called some. The turkey was about 100 yards from us. 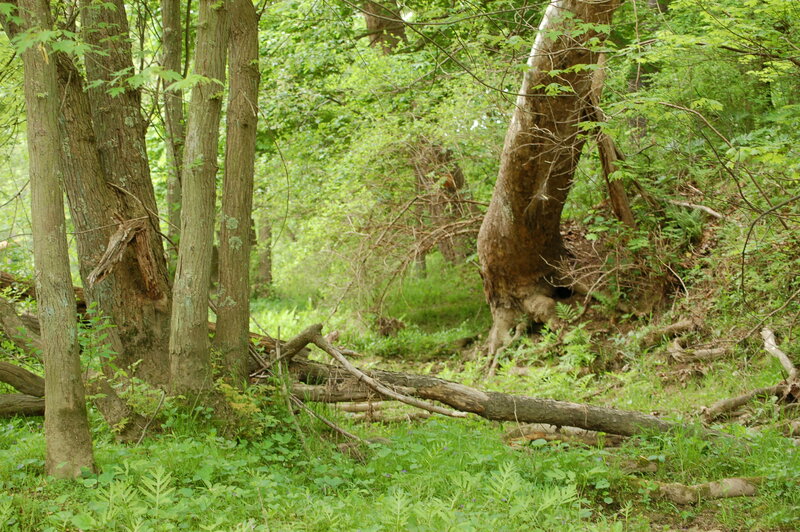 I had taken a gobbler exactly at this area a few years ago so I wasn’t totally concerned yet. Suddenly all was silent. We waited awhile to see what the bird ‘s next step was in this game. the answer is …HE WON! Later disturbances in the field’s knee-high grasses told of birds exiting away from our calling. A hen, apparently, had taken the big boy from Bob and I. That’s turkey hunting! We quit by 7:00 A.M. and headed home for bacon and eggs! I needed a change of pace this day and a morning at the back waters of Crooked Creek was to fulfill the need. I love Crooked Creek. 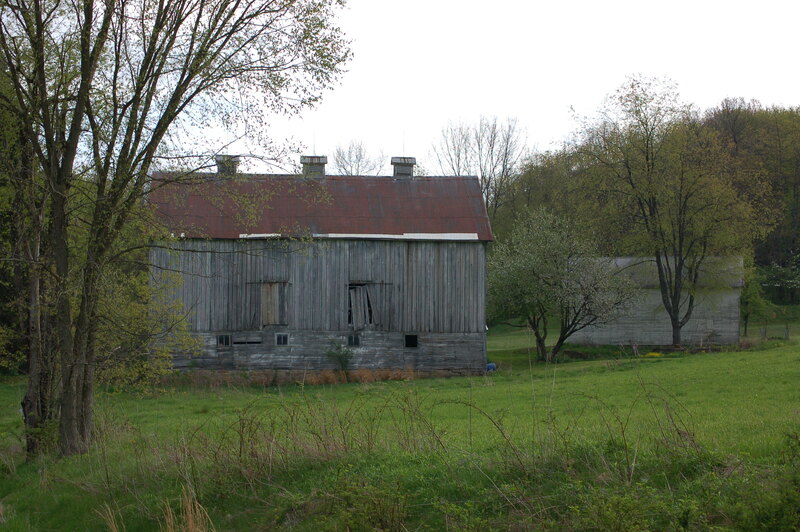 As a boy, the waters ran orange due to mind drainage from mining sites near Ernest, Pennsylvania in Indiana County. I have been so elated since these waters have been cleaned up. 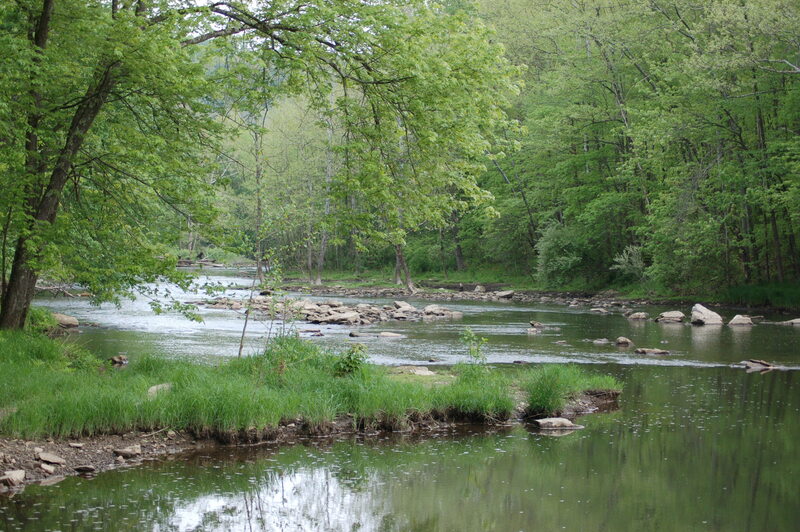 Crooked Creek today is a most beautiful section of waterways in Armstrong County. 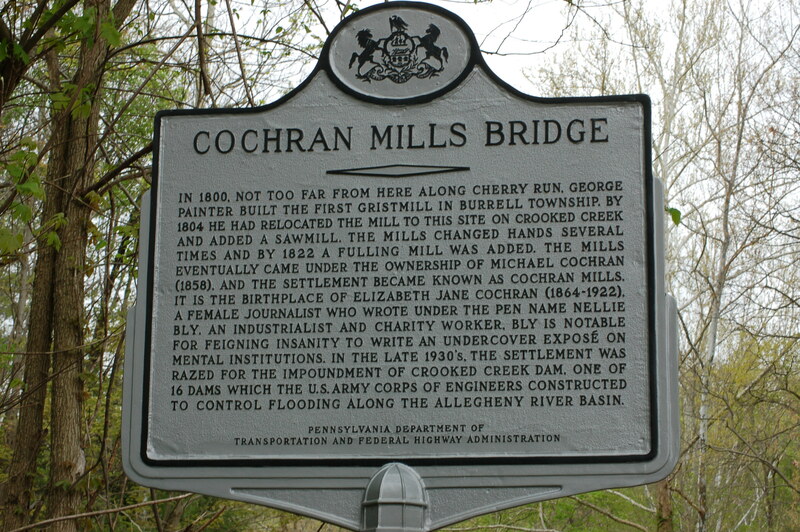 I fished an area once known as Cochran’s Mills due to a mill built here long ago. A small community was erected here too. The well-known journalist of the past, Nellie Bly was a Cochran from Cochran’s Mill, Pennsylvania. All that is left today are remnants of stone foundations here and there among the vegetation. While fishing some old memories came flooding back to my thoughts. 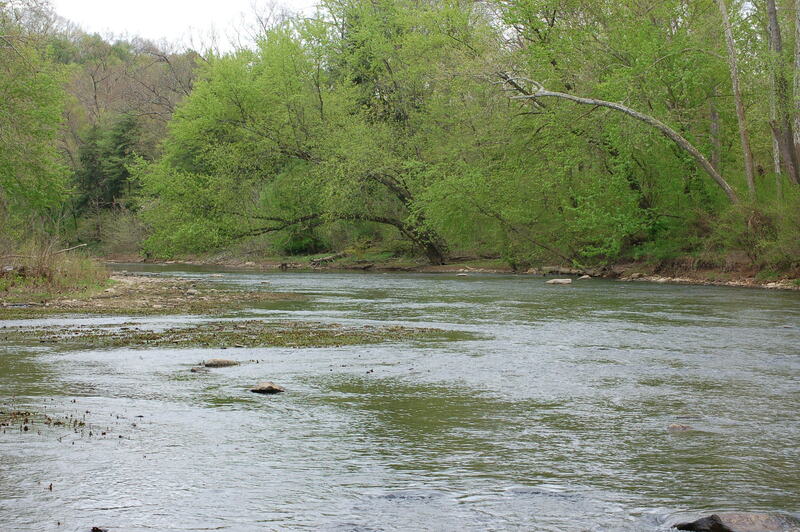 I remembered, my dad and I would come to these waters and wade around to catch crayfish for bass fishing. The quest for these “crabs” was as much fun as the bass fishing. This was an enjoyable sport for us! Whammm!!! The first fish I caught didn’t bite all that hard, but man did it fight! I could see narrow golden-brown flashes before the twenty-two to twenty-four inches of fish threw the hook! I can not say with any certainty what specie of fish it was. As the morning progressed, other species fell to the champion fisherman. I caught bluegill and pumpkinseed sunfish and smallmouth bass. As what always happens to me when fishing is the quest to explore. 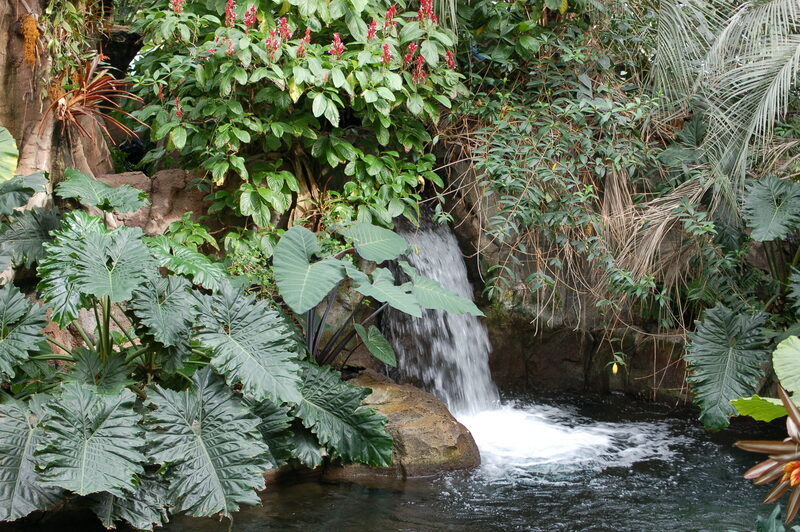 I began walking upstream to see what tidbits of nature would show themselves to me. I could hear toads doing their mating sounds. Kingfishers flew by occasionally as did a pair of mergansers. 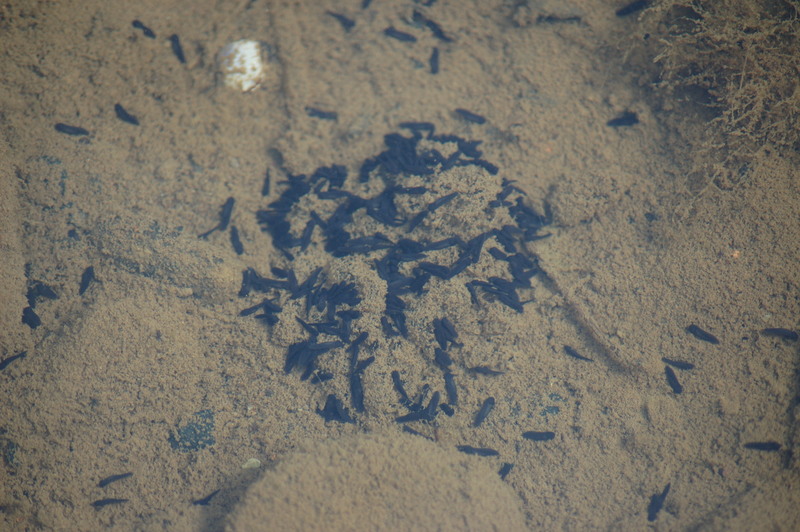 I discovered a small school of very young catfish. I remember as a boy swooping up a can full of these little cats and raising them in an aquarium. Once they grew to four inches I would restock them back into the waters. Upon gazing about a saw a water snake with a chub in its mouth. The little fish was alive and I thought of trying to catch the snake and giving the fish freedom. 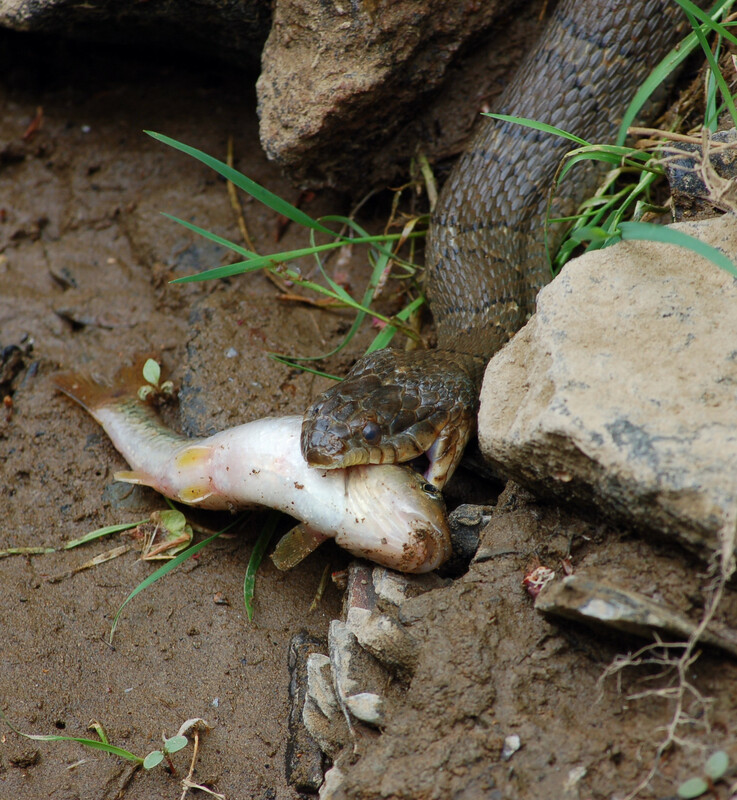 The fish, I decided, may have not survived anyway and snakes “gotta” eat too. 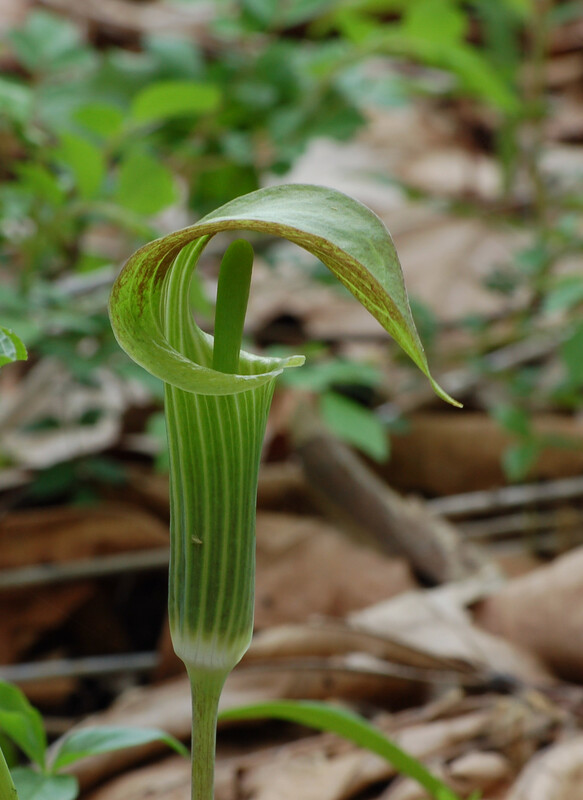 As my fishing trip turned into a nature hike I saw many jack-in-the-pulpits; false hellebore; skunk cabbage galore; trilliums…. I wondered how many people would walk along here and never see these beautiful species of wild spring growth. Mother’s day is coming up and eventually I left the beauty of Crooked Creek to head home for some mowing. Rain is being forecasted and I wanted to get the yard mowed before Sunday as family is coming in to the house.